This page should be automatically redirected to our new site. POSTPONED September Workshop - Why should we use Games and Songs in the EFL Classroom? Learning a new language is hard work, especially learning the English language. A teacher is happy when they see their students smiling, laughing and enjoying the class while they learn. It is said that students enjoy coming to class, when they can learn in a creative way, using games and songs in the classroom is a great way to reinforce the lesson and help motivate the students. If you teach mainly elementary, middle school, or even high school students, then this workshop may be for you. In this workshop, I will introduce you to some game ideas that can be used at the end or beginning of your lesson. I will also show you some songs you can use and how you can teach them. Bharati Belmore, has been teaching in the ESL field for just over 5 years now. She has taught in Korea and in Canada in both public and private schools. She has worked with elementary, middle school and adult students. Bharati has now recently started a job at a private elementary school in Nowon, in north Seoul. She teaches Science, Debate, and Language Arts to high level students in Grades 4 and 6. Her educational background includes a BA in Economics and Math, as well as a TESOL Certification. In her spare time, she enjoys running, reading, knitting, and traveling. Do you struggle with curriculum choices in conversation classes? Do you have a hard time motivating low level students to talk? Is it difficult to make your classes enjoyable while still teaching the content that will be tested? Then this workshop just might be for you. These are some of the questions that will be discussed and hopefully solved during this interactive presentation. What is the role of the textbook in my class? How is the curriculum designed in your language program? How can it be improved? How do I incorporate other skills in conversation classes? How do I come up with ideas/activities that will interest my students? John Steele has been working in Korea for 10 years. Currently, he works at Chungang University in Seoul, teaching classes such as interview skills and essay writing. In addition, he is the workshop coordinator for the Seoul Chapter, and the newly appointed ASK editor. He is the proud owner of a three year old Boston terrier, and enjoys biking up and down the Han River. 1. Line 4 (Light Blue) Sookmyung Women's University Station. Go out Exit 10 of Sookmyung Women’s University Subway Station line No. 4. Walk through the tunnel under the railway line *(Line 1 Dark Blue - see below), cross the main road, and walk up the hill towards the university. Keep going up the hill until you come to a set of traffic lights. There is a bakery on the right corner, BBang Goom Teo (now a Watson's), and a café, Can More, across the street. 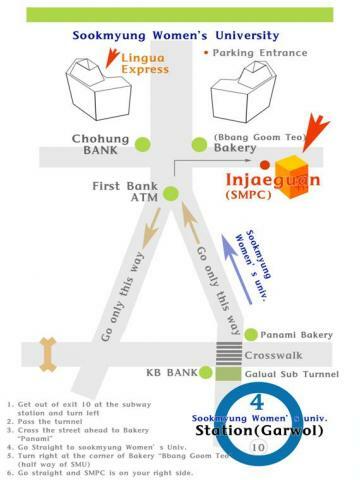 Turn right into the lane,Saem-gil, and walk uphill 150 m until you reach the Sookmyung Professional Center (Injaeguan). It’s a new grey stone building on the right, across the lane from a 'Buy the Way' convenience store. Workshops are in Room 105 on the first floor. Note: The Sookmyung Professional Center is not on the main campus. If you reach the main campus, you have gone too far up the hill. If you cannot find the building, phone one of these numbers for directions. 2. Line 1 (Dark Blue) Namyeong Station. This subway line is on elevated tracks near the university. At Exit 1, turn left. At the intersection turn right and follow the elevated train line until you reach the next light. At this location, the directions are the same as above following the asterisk (*). 3. Line 6 (Tan) Hyochang Park Station. Leave by Exit 1 or 2 . Further details TBA. Come join the Seoul Chapter on July 21st for an idea swap/picnic. We will have a one hour idea swap in our normal meeting place – Injaegwan 105 – from 2-3pm, then head just down the road to Hyochang Park for a picnic. For the idea swap, you are asked to brainstorm and bring 4 ideas/activities (1 speaking, 1 writing, 1 listening/reading and 1 unsuccessful activity) to swap with your group. After sharing ideas, we will head down to the park for a picnic, which will be a potluck event, so bring your favorite summer dish along with you. We look forward to seeing many of you for a fun packed day!